A box of lost-and-found film was nearly trashed. 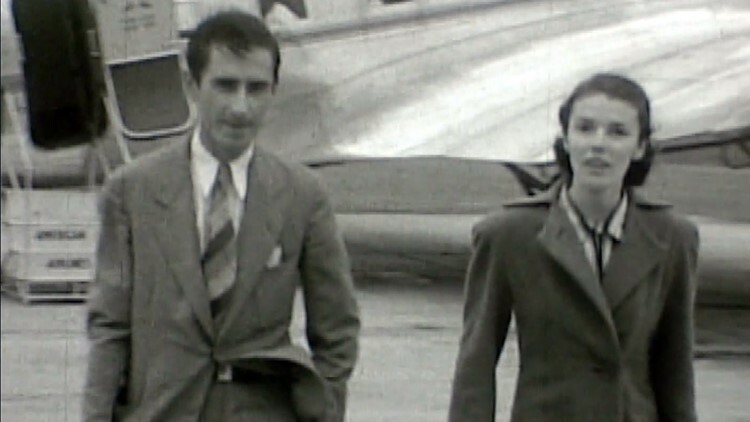 Now it is a treasure of incredible home movies from the 1930s shot by a historic photographer. We hunt for the history of the footage and the photographer in this week-long 10News series. Reporter's note, Nov. 19, 1:15 p.m. - If the videos embedded within this article do not display on your device, there is a bullet-list at the end of the article with direct links to all five parts of the series and the extra videos of Granville Hunt's full lost-and-found footage. (WBIR) An old box of unseen film was nearly thrown in the trash. Now it is a historic treasure. Professional archivists call the discovery "a miracle." The films contain pristine color home movies shot in the 1930s and 1940s. These are far from your typical home movies. They were filmed by a trailblazing professional photographer and filmmaker with tremendous skill. The images provide a window in time with scenes of cities, Hollywood stars, the Great Smoky Mountains, marquee sporting events, and historic farms. WBIR 10News reporter Jim Matheny takes you on a "Hunt for History" to learn about the incredible people and places in the lost films of Granville Hunt. In 2016 at his home in Sweetwater, Monty Barger cleaned out the storage shed in his yard. He made a pile for trash and a pile for items to keep. In the trash pile sat a weathered carrying case full of unseen films he bought at a community auction in 1970. 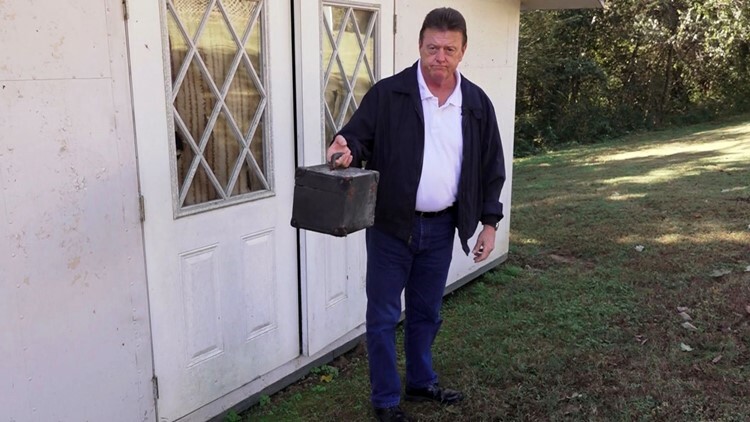 "I bought the box of film at a community auction that was raising money for a park in Philadelphia, Tennessee. I asked the guy who donated it what was on the films. He said it had shots of early-Knoxville, but didn't know much about it. It came with a projector, but I never could get it to work. I put the film in a storage shed and forgot about them. I never did open them again," said Barger. 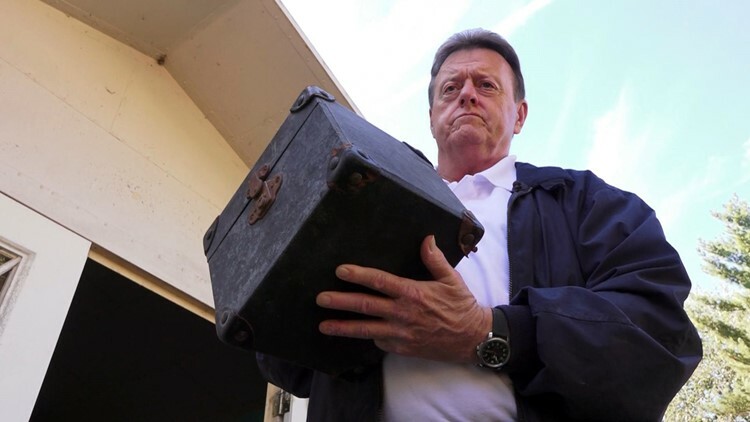 Monty Barger of Sweetwater holds the box of unseen films he purchased and kept stored since the early-1970s. Barger nearly trashed the film a few times in the decades since he bought it, usually when cleaning out a storage area. On multiple occasions, he placed the box in a throw-away pile and then had a last-second change of heart. "It has been stored in all types of weather. I didn't know if the film was still any good. Just something in the back of my mind said this will mean something to someone," said Barger. Through family connections, Barger sent the box of films to me (WBIR reporter Jim Matheny). I then took the box to the archivists at the Tennessee Archive of Moving Image and Sound (TAMIS) to see if the film was viewable. 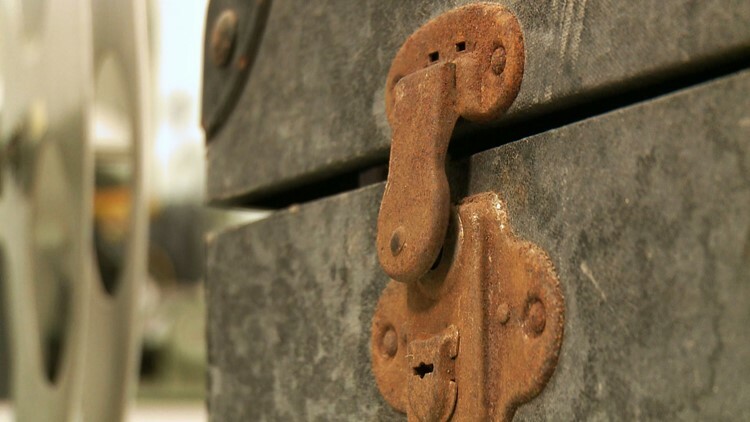 The hinges and hardware on a box of unseen films have rusted after spending decades stashed in storage. "Man, that is old," said professional archivist Bradley Reeves as he opened the worn case full of metal canisters. "This has been stuck in a can all these years. Usually, materials like this stew in their own juices, decompose, and crumble to the touch. It is 50-50 whether this film will be a pile of dust or usable." Reeves opened the first metal canister and took a whiff of the film, smelling for the dreaded vinegar odor that accompanies decomposed film. "That is in mint condition. Look at this label, it says 'Smoky Mountains 1939.' This looks like some really historic footage. These are 16-millimeter films. They are silent home movies and they're in color. People were shooting home movies in color even before Hollywood," said Reeves. 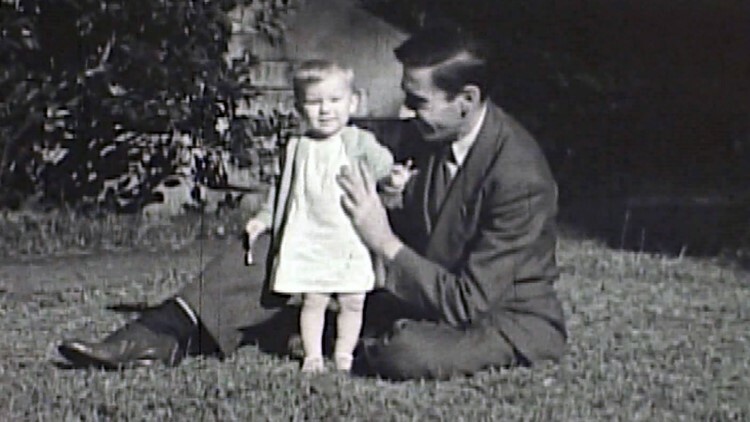 Professional film archivist Bradley Reeves examines lost-and-found 16-milimeter home movies. 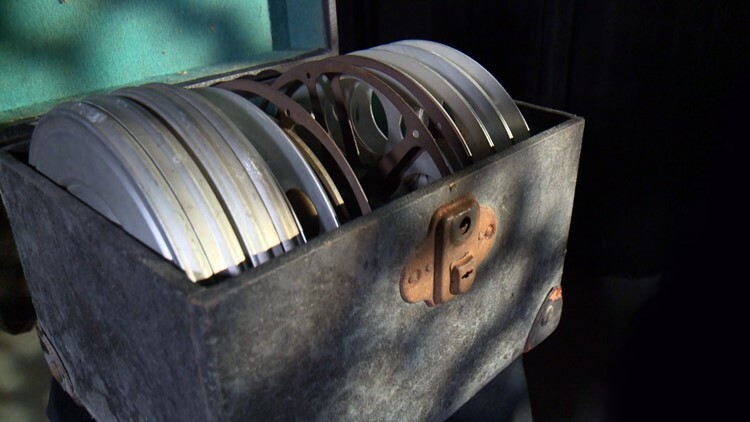 Reeves then opened seven more metal canisters and found all the films in terrific shape. "I cannot wait to see what is on these films. First, we need to give the film a bath. We use a cleaner and a lubricant that essentially takes off 80 years of gunk," said Reeves. With the film cleaned and ready to roll, Reeves was unable to contain his excitement as the vibrant color images appeared on the screen. "Oh, this is beautiful! Look at this! Whoever shot this was clearly a pro. Look at the color and the beautiful composition. This person knew what they were doing. A lot of the amateur footage only lasts a couple of seconds and is really jerky. This was a serious filmmaker with a natural ability," said Reeves. 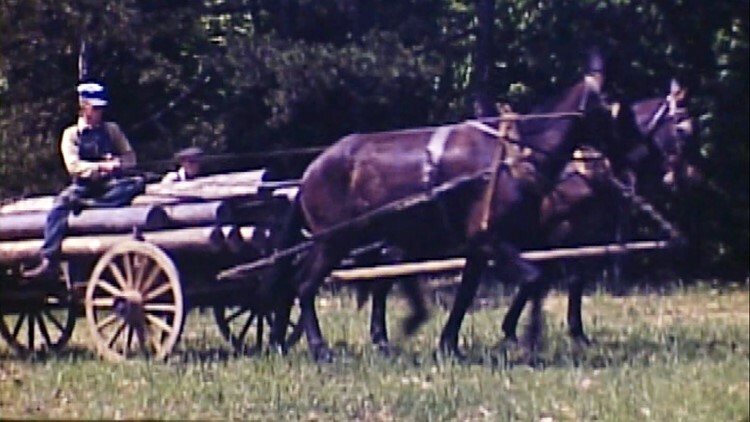 Color 16mm home movies include shots of logs hauled on an old-fashioned buggy at a farm in Loudon County. The reels show images of sporting events, including the 1939 Orange Bowl and the 1939 Kentucky Derby. The scenes shift to the Great Smoky Mountains, a dairy farm, and a mother holding a newborn daughter. The footage rolls and reveals shots of trolleys on Gay Street in Downtown Knoxville. Movie stars emerge from airplanes at the brand new McGhee Tyson Airport in the 1930s. Theaters sell tickets for the new movie "Gone with the Wind" as heavy snow blankets Knoxville in January 1940. The reels then show off the filmmaker's skill with several minutes of trick photography and stop-motion animations. "This is incredible. This is someone who really knew how to shoot and have fun with a camera," said Reeves. Bradley Reeves marvels at the historic footage in a box of lost-and-found home movies shot by Granville Hunt. TAMIS receives many home movies that are deemed "orphan" films because there is no way to identify who shot the footage. In this case, the films come complete with a signature. 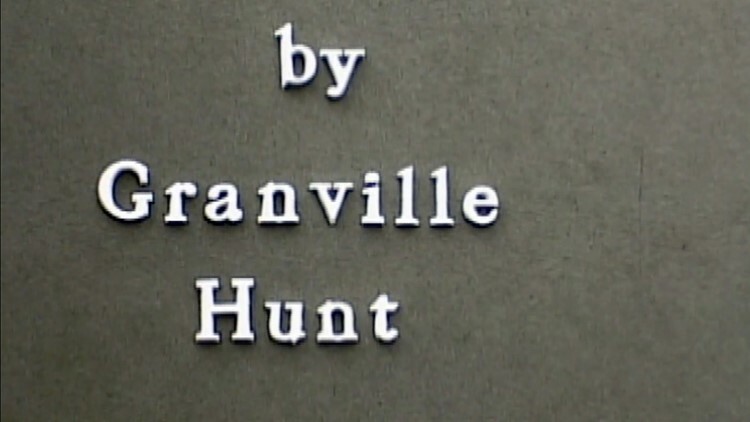 Title screens appear that state the photography is "by Granville Hunt." "As you can see, we know these were shot by Granville Hunt. Now we begin the research to figure out who this guy was. It's a mystery I love to solve," said Reeves. "This is unique footage and historically valuable. My goodness, you have to consider these are one-of-one. There are no other copies out there. They are home movies, not mass-produced." 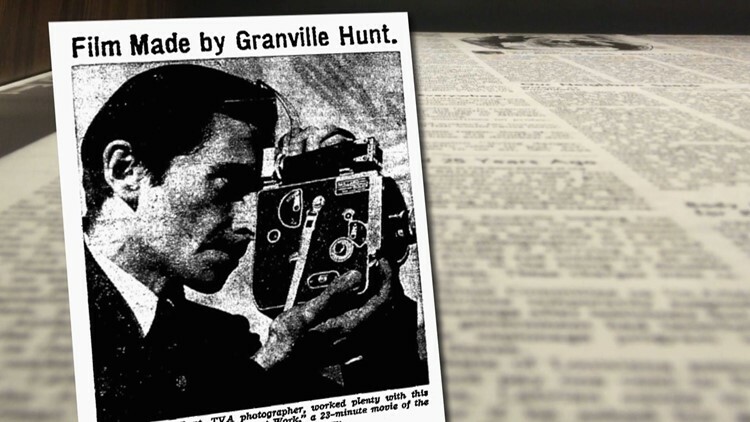 A title screen on lost-and-found footage clearly identifies the photographer as Granville Hunt. We know the name of the photographer. But who was Granville Hunt? How did he become so skilled with a camera? Who are the other people in the films? When and where was this footage shot? What do those places look like today? LAUNCHING THE "HUNT FOR HISTORY"
Before we delve into all the information discovered about Granville Hunt and this amazing lost-and-found footage, here's some insight into how I chipped away at this "Hunt for History" for a couple of years. First, the "Find A Grave" website showed Granville Hunt was buried in Loudon County and died Oct. 18, 1963. 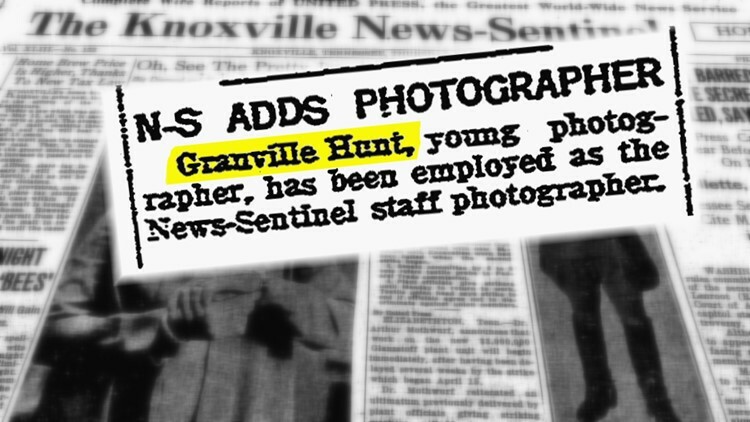 With a trip to the library to view microfilm copies of the newspaper, you'll find the Knoxville News Sentinel headline "Granville Hunt Dies at Age 54" published on the date of his death. Hunt's obituary reveals he died from cancer of the esophagus. It also said Hunt was one of Knoxville's first newspaper staff photographers in the 1920s before beginning a 25-year career as a photographer with TVA. There's no more wondering why the home movies look so professional. They were shot by a pro. The obituary includes other details about Hunt's career with TVA, including an assignment in Chattanooga during World War II that involved "exciting, top-secret work." You also find the name of a wife, Mildred Robinson Hunt, and a daughter, Karen, as surviving relatives in 1963. In addition to information specifically about Hunt's life, old newspapers and city directories are also invaluable for determining when and where these lost-and-found movies were shot. For example, you see footage of actor Raymond Massey at the McGhee Tyson airport. 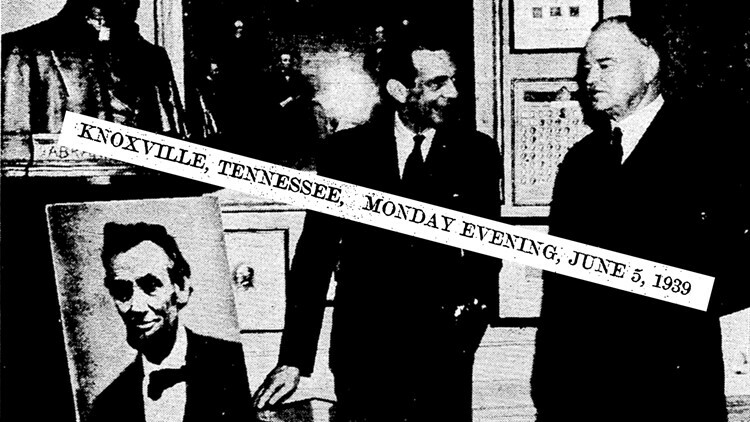 In June 1939, the Knoxville News Sentinel published an article about Raymond Massey flying to Knoxville to receive an honorary degree from Lincoln Memorial University. A large visual part of telling the story is shooting photographs from the same angle today as Hunt shot them in the 1930s and 1940s. Photos from the same angle have been juxtaposed with a slider tool for you to compare the scenes of today with the same perspective in the past. It is often difficult to identify a shot's location. For example, a shot of a man walking along a city street in 1939 does not resemble anywhere in Knoxville today. If you look up the name of the businesses shown in the background in a 1930s city directory, you learn you're looking at an entire city block that has been torn down and replaced with a parking deck on Walnut Street. A June 5, 1939, newspaper reveals the date Granville Hunt shot footage of Raymond Massey during the actor's visit to receive an honorary diploma at LMU. The search also turned up a collection of photographs and writings by Granville Hunt in the Special Collections of the library at the University of Tennessee. For all the information in libraries and online databases, there is no resource more valuable than talking directly to people. To learn more about these films and the man behind the camera, I conducted interviews with several historians and archivists. I also began an exhaustive search to locate a family member shown in the films. The end result is we learn Granville Hunt did not just shoot film of history. He was a historic figure himself. Here is the story of the footage and the man behind the camera. Granville Hunt's parents moved to Knoxville shortly after he was born in Chattanooga. His father, James Hunt, was a commercial artist and sign-maker who enjoyed sharing stories of his wartime adventures as a bugler in Spanish American War. The apple did not fall far from the tree. Granville Hunt grew up with a flair for drama and art. He also loved sharing stories of current events and embarking on daring adventures. 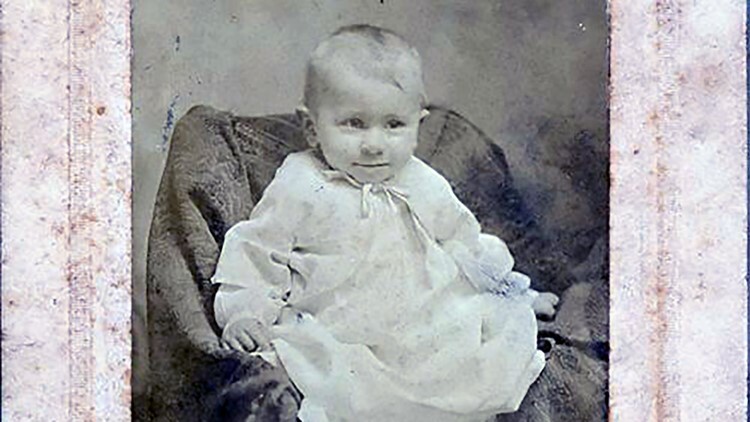 1909 baby picture of Granville Hunt. Photo submitted by Carol Brown. As a child, Hunt began working as a copy boy for the Knoxville News, the predecessor to the Knoxville News-Sentinel. Hunt's name appears several times in the Knoxville News as a reporter for the weekly kids' edition of the newspaper in 1922. Hunt also developed a love of the stage and cinema. Early newspaper articles show he acted in plays at Downtown Knoxville theaters. A 1926 article says Hunt was a student at Knoxville High School who wanted to be a movie director. Hunt was a high school student when he began working for the Thompson Co., the premier commercial photography business in Knoxville headed by Jim Thompson. Within a couple of years, Granville Hunt returned to the news business as one of Knoxville's first staff photographers for the Knoxville News Sentinel in May 1929. A 1929 blurb on the front page of the Knoxville News Sentinel announces the hiring of young photographer Granville Hunt. "He was a professional photographer for the newspaper for several years and then joined TVA and worked there for 25 years. He had quite a reputation as a photographer," said film archivist Bradley Reeves. Hunt photographed news, sports, and was a daredevil when it came to capturing dramatic shots for the newspaper. Several captions describe the lengths Granville Hunt went to in order to snap the picture, such as hanging out of the door of an airplane, standing in an area exposed to a dynamite blast, or riding a Studebaker car traveling at the then-incredible speed of 90 miles per hour. Granville Hunt's name was in the newspaper in the 1920s for more than his daring photography. He was an Eagle Scout and one of the best young hikers in the area. Despite his relative youth, Hunt led treks for the new Smoky Mountain Hiking Club. 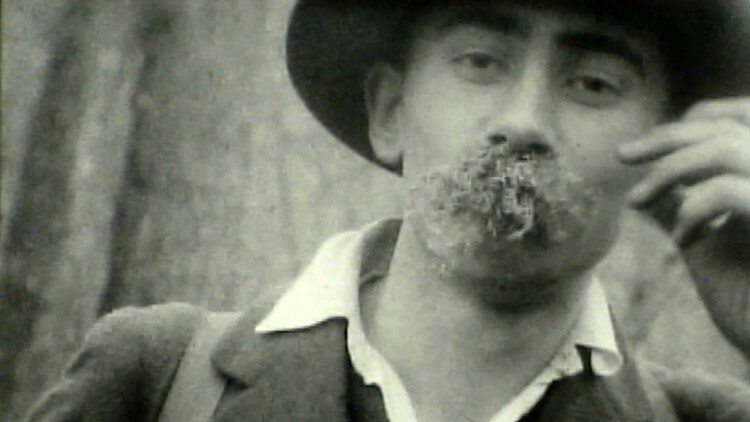 A shot of a young Granville Hunt playfully wears a moss mustache in 1920s footage shot by Jim Thompson of the Smoky Mountain Hiking Club. 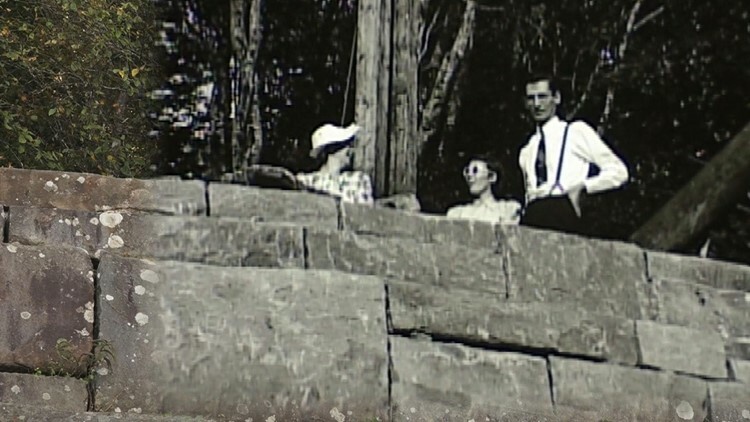 A young Hunt can be seen posing and having fun in some of the earliest films of the Smokies shot by Jim Thompson. Photographs and films of the Smokies by Jim Thompson, with help from Granville Hunt, played a major role in gaining public support for the creation of the Great Smoky Mountains National Park. In the summer of 1929, Hunt began marking his path in history. He was appointed by Myron Avery to blaze the new Appalachian Trail through the Great Smoky Mountains. Hunt and Roy Ozmer drudged through the wilderness together along the Tennessee and North Carolina state line for a few weeks to mark 128 miles of the new Maine-to-Georgia route. "It is Hunt and Ozmer that go through step-by-step in the Smokies to find the actual way the trail will go," said Charles Maynard. "They are carrying a lot of equipment and marking the highest elevations of the entire Appalachian Trail at Clingmans Dome. These places are not easy to reach. There were no trails." 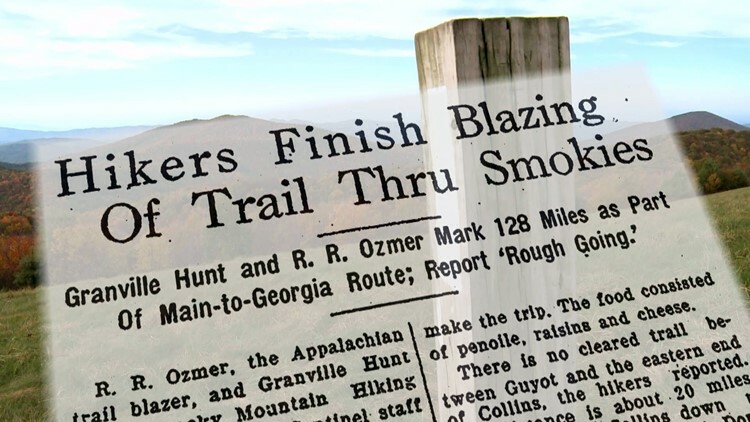 In the summer of 1929, Granville Hunt and Roy Ozmer finished blazing 128 miles of the new Appalachian Trail through the Great Smoky Mountains. Charles Maynard has written several books on the history of the Great Smoky Mountains and the Appalachian Trail. He served as the first executive director of the non-profit Friends of the Smokies and also serves on the national board of the Appalachian Trail Conservancy. He says there are several reasons Hunt was chosen to mark the rugged section of the new Appalachian Trail through the Smokies. "First of all, Hunt is a very good hiker and he is from this area. He has hiked a lot in the Smokies and knows how to make it for an extended period in the wilderness. The other main thing is both he and Ozmer are young. They were physically able to do the job and they had time to do it. Guys who were just a few years older might have a job and a family to support. Ozmer and Hunt were experts who were also young enough that they could to afford to spend a few weeks in the summer marking the trail," said Maynard. Several articles appear in the Knoxville News Sentinel in 1929 about Hunt marking the Appalachian Trail. Hunt is also mentioned in the August 1931 issue of Field and Stream magazine in an article written by Roy Ozmer titled, "Blazing the Great Smokey (sic) Trail." Recently-discovered color footage by Granville Hunt in 1939 shows a woman at the Chimney Tops picnic area in the Great Smoky Mountains. 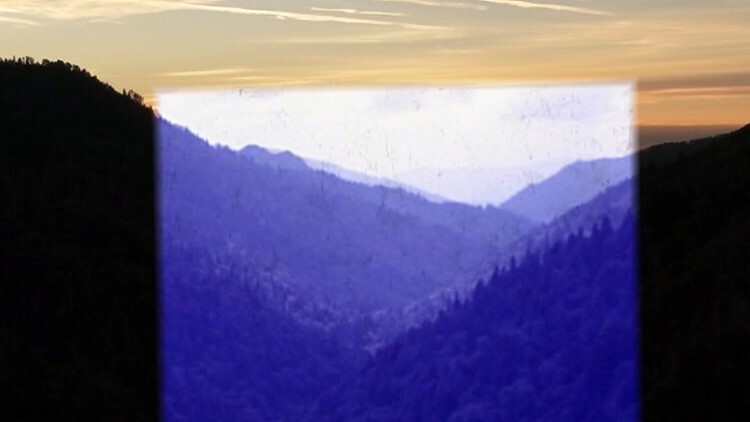 It should be no surprise a large portion of the lost-and-found films of Granville Hunt includes beautiful scenes of the Great Smoky Mountains. One of the reels has more than 12 minutes of amazing color images of the park in 1939, a year before it was officially dedicated. You see classic cars roll through the tunnels on Newfound Gap Road and tourists enjoying the Chimney Tops, Mount LeConte, and The Sinks waterfalls on the Little River. "I was amazed to see these color movies of the Smokies in its early days as a park. It is almost like time travel. You are getting to look over Granville Hunt's shoulder at a young forest that had been logged instead of the mature forest that we see now. There are views and overlooks you truly cannot see anymore because the forest has grown up. You get so much more of what he experienced by seeing these movies instead of just one snapshot. It is important for us today because without a sense of how we got this [park and trail], you take it for granted like it has always been here," said Maynard. There is certainly no shortage of home movies of the Great Smoky Mountains in its infancy. 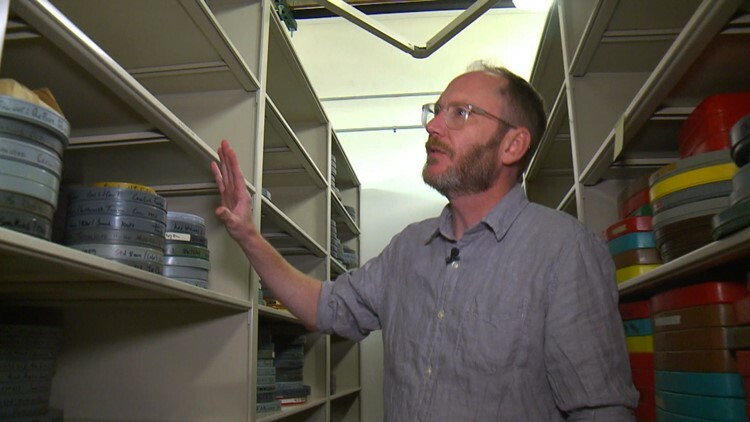 Professional archivist Bradley Reeves says there is more footage of the Smokies than any other location in the collection of home movies at the Tennessee Archive of Moving Image and Sound (TAMIS). An overlay of Granville Hunt's footage of Morton Overlook in the Great Smoky Mountains in 1939 with a shot from the same angle in 2018. What makes the Granville Hunt footage in 1939 so spectacular and unique is its professional perspective and artistic eye. "The difference here is the quality. It is shot on 16-millimeter film, which is a higher-quality format than 8-millimeter. The photographer is a professional. He holds the camera for steady shots that last several seconds. The color is stunning. The pictures are composed beautifully. It's a work of art that really captures the beauty of the mountains," said Reeves. "It's amazing to find this hidden treasure of home movies. You're getting to look over Granville Hunt's shoulder at what he saw," said Maynard. "You get a sense of what he was experiencing. I think people should care because it's a window in time that sets up our time." The adventurous young Granville Hunt from Knoxville made headlines in the summer of 1929 for blazing the Appalachian Trail through the Smokies. Yet, at that point, Hunt was already making the front page of the newspaper for a living. Hunt was hired in May 1929 as one of the city's first newspaper staff photographers. Hunt joined the staff of the News Sentinel, which was a natural transition after working for years at the paper as a copy boy. 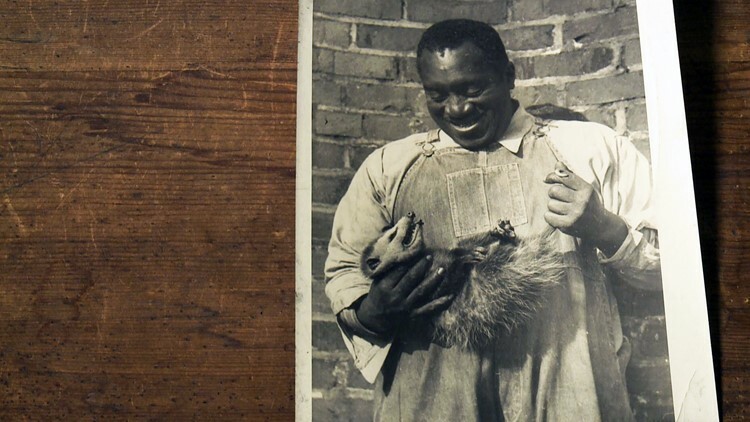 A Granville Hunt photograph of a man holding an opossum is part of a collection of Hunt's pictures at UT Special Collections. Hunt shot news, sports, and life in East Tennessee at the dawn of the golden age of photojournalism. "Granville worked at the newspaper and he obviously knew what he was doing. He had great skill and shot a wide variety of subjects," said professional film archivist Bradley Reeves. The Knoxville News Sentinel archives show Hunt was a prolific photographer with an artistic streak. On multiple occasions, the paper included captions with Hunt's photographs noting they sent him to shoot a disaster and he came back with a postcard. One caption for a photograph of sunlight glistening on floodwaters in Knoxville said "Hunt has an incorrigible poetic streak" and posed the rhetorical question, "What's a newspaper supposed to do when a photographer brings back a beautiful picture like this other than print it?" 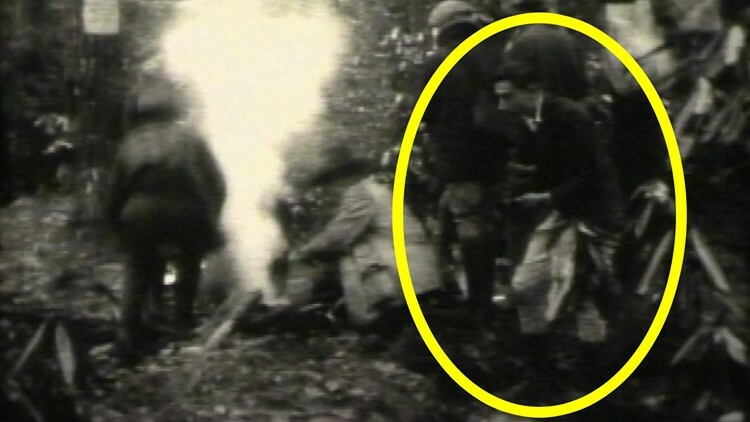 1920s footage by Jim Thompson in the Great Smoky Mountains shows a young Granville Hunt taking photographs. The University of Tennessee's Special Collections has a box of Hunt's photographs and news clippings from the early-1930s. The collection includes a four-page typed story by Hunt about an explosive assignment in September 1933. "He's working for the Knoxville News Sentinel and goes to cover the first early-stages of construction of Norris Dam," said Pat Ezzell, TVA historian. "The crews are going to blast part of the cliff. The head dynamite guy explains where he [Hunt] needs to stand to be safe, that it's going to be fine, it's going to blow the rock away [in one piece], and that is definitely not what happens." Instead of tearing away one solid chunk of the cliff, the 400 pounds of dynamite shattered the hillside and sent a shower of boulders and rocks across the river at Granville Hunt. Boulders three-feet wide landed all around him. Some of the large boulders were thrown more than 100 yards beyond where the group of photographers were standing. 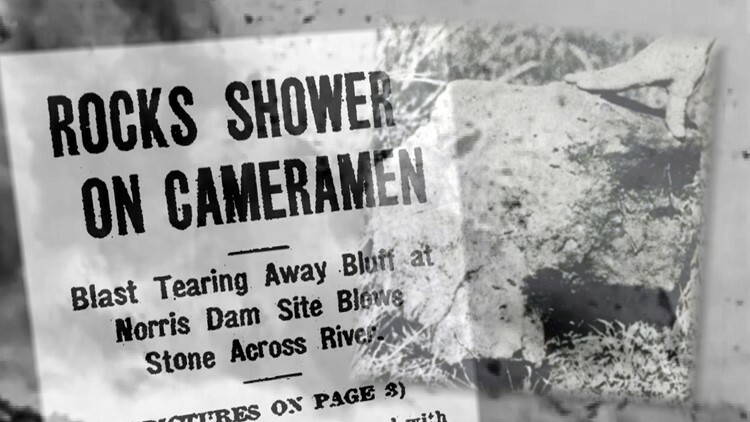 A collage of September 1933 headlines and photos about dynamite blasts showering Granville Hunt with rocks at the beginning of construction at Norris Dam. A flying rock tore the camera from Hunt's hand as he ran for cover. The debris shredded trees and peppered Hunt with "machine gun fire" of smaller stones. Hunt wrote the rocks hailed down for "the most thrilling 20 seconds of my life" before the sky began to clear. Hunt's notes say nobody was injured aside from bruised backs. "He published that story in the News Sentinel with his photos. The clincher of the story is shortly thereafter, maybe the end of the week, he became a photographer for TVA," smiled Ezzell. Hunt landed a job with the brand-new TVA photographic division in October 1933. When the division opened in November 1933, it consisted of Hunt assisting head photographer E.H. Neukon of Ohio and outsourced New York photographer Lewis Hine. The article in the News Sentinel states, "Hunt's job is to take pictures of all the houses and property acquired for the Norris Dam reservoir." 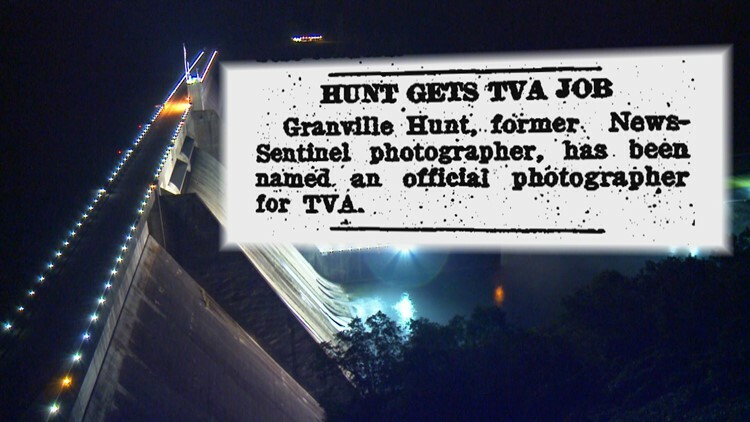 The News Sentinel published an announcement that its newspaper photograher Granville Hunt was hired by TVA in October 1933. As a TVA photographer, Hunt continued documenting the construction of Norris Dam and all the other projects that tamed the rivers of the valley while delivering a new age of electricity. "TVA had a staff of photographers and they took amazing photos. They shot everything from the construction pictures of the dams to the quality-of-life cultural pictures that show how hard life was in East Tennessee," said Ezzell. A Knoxville News Sentinel article in 1934 says Hunt was responsible for photographing more than 4,000 graves that would be relocated before the creation of Norris Dam and Reservoir. The article also says hundreds of people have already applied for jobs as gravediggers before the positions have even been posted. "People needed a job, they were desperate, and TVA paid well. I think to be a photographer for TVA back then would have to be one of the best jobs around," said Ezzell. "In my mind, I think of those photographers like cowboys. Some of these photos from great heights, I think about the danger and risk these guys were willing to take to get some of these shots." Hunt's professional skill with a camera comes through in the lost-and-found home movies that were nearly thrown away. "Mr. Hunt knew what he was doing. You see fade-ins and fade-outs. That is so unusual for an amateur film," said Reeves. "He was using special effects and having fun with a camera." 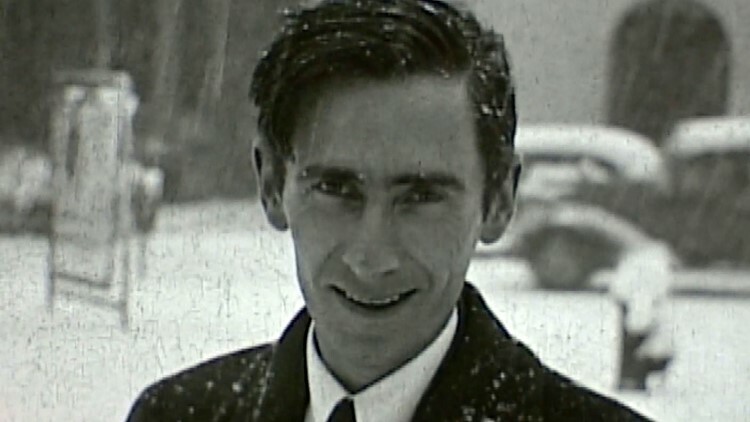 Granville Hunt during the January 1940 snow storm in Knoxville. Hunt sometimes handed his 16mm camera to friends, who were also professional photographers, to include shots of himself in his home movies. In 1938, the News Sentinel published articles about the formation of a club for Knoxville's amateur movie photographers. Hunt organized the club and affiliated it with the national Amateur Cinema League. Hunt may have left the news business, but he never lost his love for capturing current events. When something big happened in news, sports, and weather, he shot it on his home movie camera. "You see in the film movie stars like Raymond Massey coming to Knoxville. It's really interesting to see the brand new McGhee Tyson Airport," said Reeves. Massey was a famous actor who was in town in June 1939 to receive an honorary diploma from LMU for his portrayal of Abraham Lincoln. It was quite a day in LMU's history with Massey in attendance and former U.S. President Herbert Hoover delivering the commencement speech. Sometimes, Hunt captured history merely by shooting film of his friends. The movies include shots of Knoxville's B.F. Henry. He was a groomsman in Hunt's wedding and a reporter for the Knoxville News Sentinel. Henry went on to become the longtime editor of The Washington Post. 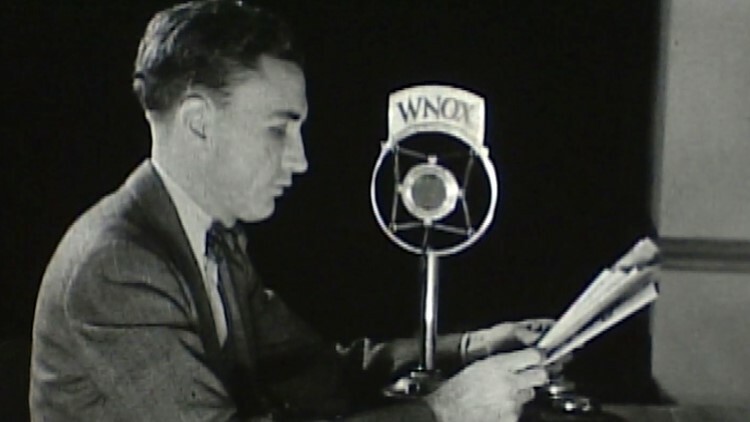 Granville Hunt's 1939 films show Knoxville News Sentinel reporter B.F. Henry, Jr., delivering the news on WNOX. Henry later became editor of The Washington Post. The footage also includes shots of News Sentinel photographer Harold Davis as well as TVA photographers Jim McCoy and Sherrill Lakey. A captivating portion of Hunt's lost-and-found films features shots of Downtown Knoxville during a large snowstorm on January 23, 1940. Deep snow piles up as Hunt shoots scenes of Gay Street, the Tennessee Theatre, and the old Knox County Courthouse. A large marquee advertises tickets for the new movie "Gone with the Wind." While the near-record snow is the main focus of the footage, archivists are enthralled with the images in the background. 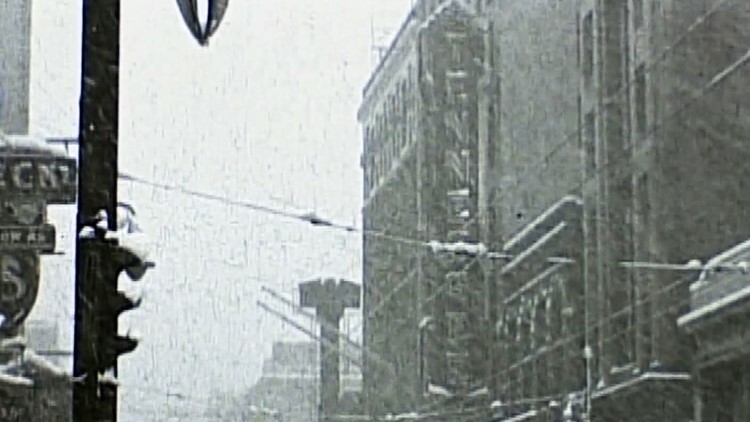 Granville Hunt's lost films includes shots of heavy snow in Downtown Knoxville in January 1940. "You have whole city blocks that have been torn down since then. You see the famous Lyric Theater that goes back to the late-1800s. We didn't have any footage of the Lyric. There are lots of missing pieces of the downtown puzzle," said Reeves. Other shots include streetcars on Gay Street and springtime dogwood blooms in Sequoyah Hills. Hunt put his filmmaking abilities to use for the local library and the University of Tennessee. In 1940, an article in the News Sentinel covers Hunt's creation of an educational film titled "Your Library at Work" to highlight the services and resources available at Knoxville's Lawson Library. Granville Hunt worked as one of the first professional staff photographers at the Knoxville News Sentinel in the 1920s and then joined the new TVA in 1933. In 1941, Hunt shot a film called "Your University at Work" about the University of Tennessee. This was the first official movie UT ever produced. The final product was an 11-minute film showcasing the ways the university benefits the region. An article in the News Sentinel about the film's "world premiere" at the Tennessee Theatre expressed shock because "it does not include a speck of football." The Knox County Public Library and the University of Tennessee have not been able to locate copies of the films shot by Hunt. This makes the discovery of his lost home movies even more historically-valuable. Granville Hunt's films show the red-masked horse named Johnstown rounding the fourth turn en route to victory at the 1939 Kentucky Derby. Hunt and his friends clearly loved the news. Hunt also loved sports. One reel of Hunt's lost-and-found films contains color footage of the Kentucky Derby in May 1939. It is possibly the only known color footage of the 1939 race. It is certainly the only color footage shot by a professional on a 16-millimeter home movie camera from a prime position on the infield rail. The Kentucky Derby is a 1.25-mile race on a 1-mile track. Hunt positioned himself on the home stretch after turn four, allowing him to get up-close shots of the horses at the start of the race and as they round the final turn for the home stretch. 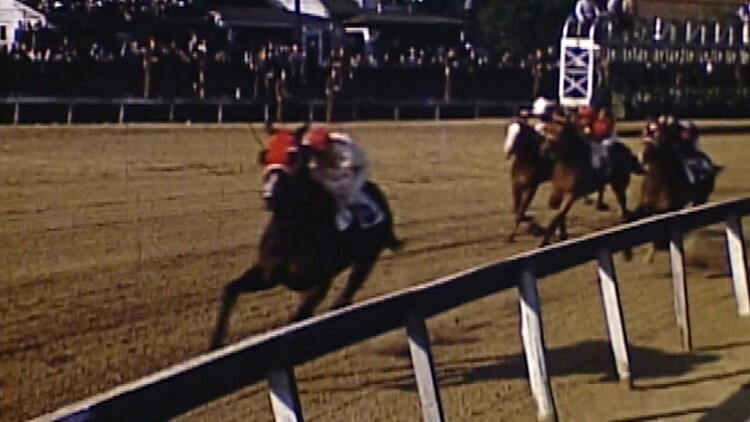 The footage shows a horse named Johnstown wearing a bright red mask burst out of the gate, gallop by the camera at the start of the race, then charge around the fourth turn en route to the title at Churchill Downs. Another reel from the beginning of 1939 seems to be a typical Florida vacation with vibrant color shots from Miami Beach. Then the footage suddenly strikes gridiron gold. 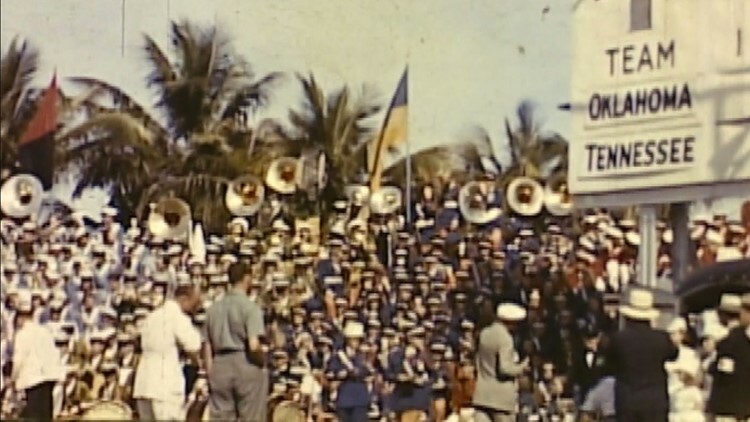 Color 16mm home movies shot by Granville Hunt include the 1939 Orange Bowl. "You find stuff like this that absolutely blows you away," said Reeves. "They are in Miami because the Vols are playing in the Orange Bowl." The family has traveled to Miami for the 1939 Orange Bowl where the undefeated Tennessee Vols played the undefeated Oklahoma Sooners. Hunt shot color footage of the game that capped the first national championship season for UT and legendary head football coach Robert Neyland. "You see General Neyland and the Vols. It's not just the game, but the fans and the stands," said Eric Dawson at TAMIS. Hunt teamed up with Frank Rouser, the owner of a photo shop in Knoxville, to shoot the game from multiple angles. The two then edited the highlight reels together and played the films in Rouser's storefront window. 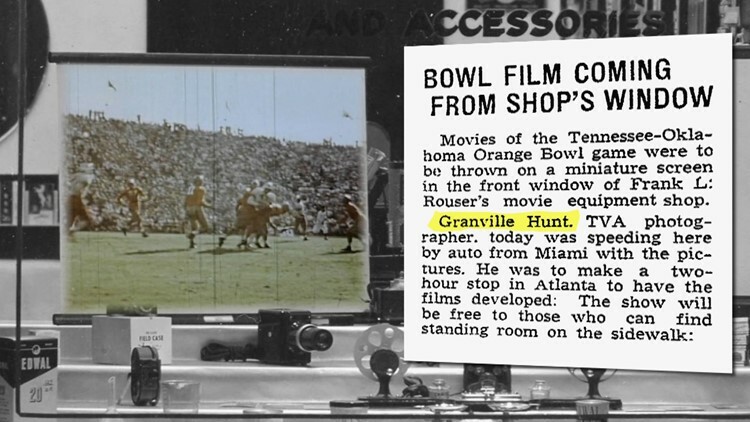 Color films of the 1939 Orange Bowl shot by Granville Hunt were edited together with footage by Frank Rouser and played in the storefront window of Rouser's photography shop. "They would film these games, edit them together, and have public screenings. They created artwork and were very clever and creative," said Dawson. "This was long before the days of television. These public screenings were the only way you could see the game if you did not make the trip to Miami." Hunt provided a window to the world of sports that would have otherwise been unavailable to fans of the Volunteers. Without the miraculous discovery of his lost films, we may have never had this view of history and the adventurous nature of a Knoxville photographer. "These are incredible shots that nobody else has. You're never going to see anything quite like this again," said Dawson. To briefly recap, a lost box of film not only turns out to have incredible footage of Knoxville, the Smokies, and landmark moments in sports history. The footage was shot by one of the first professional news photographers in Knoxville history who also happens to be the guy who blazed the Appalachian Trail through the Great Smoky Mountains. And we still have not told you about Hunt's role in World War 2 or his amazing family. 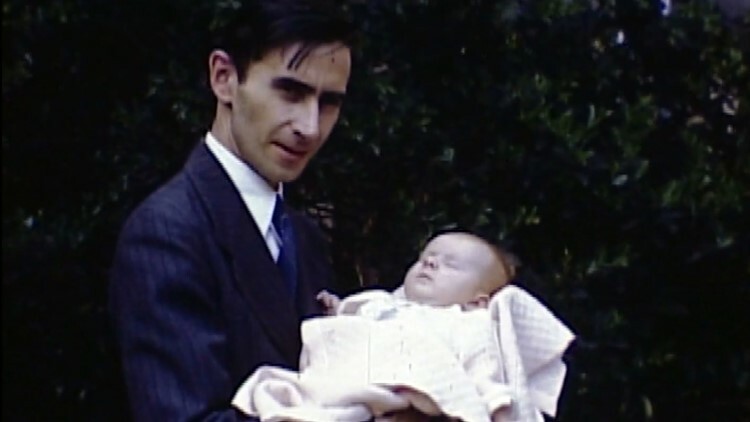 Several reels of Granville Hunt's rediscovered home movies show the life of his daughter, Karen Robinson Hunt, from a newborn in 1945 through her first birthday party in 1946. After searching obituaries, marriage records, newspaper articles, and other databases, I located the woman who appeared in the films as an energetic infant. 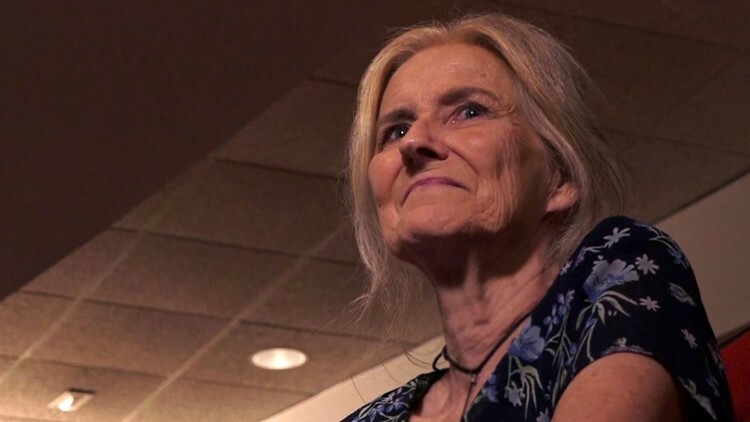 Karen Robinson Hunt Hackney now lives in Bowling Green, Kentucky, where she is a retired professor of physics and astronomy professor at Western Kentucky University. Hackney and her late-husband both served as the head of the NASA Consortium for the state of Kentucky. "I spent my summers at the farm, too. You see in those films, farming in those days was difficult. We had to plow some areas with mules. During those summers, my father would drive back and forth from the farm to his job at TVA in Chattanooga. Some of my proudest memories were when he flew over the farm to photograph the TVA transmission lines. He would get the pilot to circle and we would wave at him while he was hanging out of that airplane with his camera," smiled Hackney. "TVA made a tremendous amount of contributions during World War 2. A lot of people are not aware we had the maps and surveys unit in Chattanooga," said TVA historian Pat Ezzell. "The work they did there was so secretive, the only photos we have of the operation were taken after the war. They re-created some of the work for photos after the war, but never allowed cameras when it was actually taking place." "Reconnaissance would send all the aerial pictures they took over enemy territory to Chattanooga. 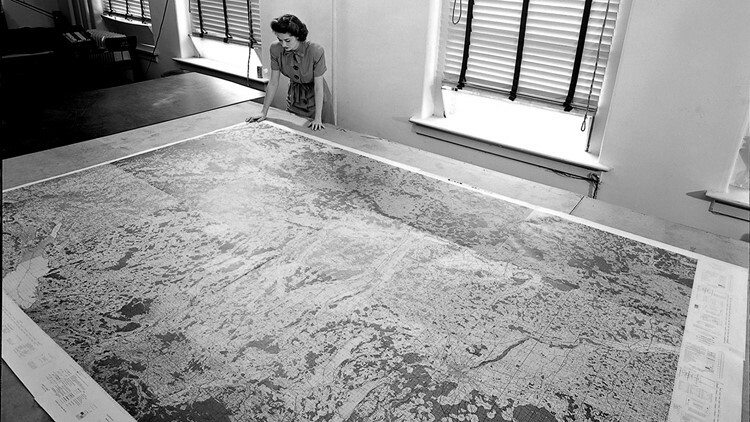 They would develop these huge prints that were then converted to maps and sent back to the war in Europe and the Pacific," said Hackney. For an adventurous person like Granville Hunt, there were mixed feelings about serving his country in an office in Chattanooga while his friends went overseas to fight. Hunt was in his 30s and physically able to fight. He was also an expert outdoorsman who blazed the Appalachian Trail. More than once, he tried to leave TVA and enlist for combat. TVA's maps and surveys group in Chattanooga mapped more than 500,000 miles of enemy territory and troop movements during World War 2. "He would get on the bus and head to Fort Oglethorpe. The military never would take him because they said, 'You have to go back and keep doing your job.' The job that he was doing was so vital and there was not time to get anybody in and trained his level," said Hackney. Hunt fought for his country as hard as he could from home. 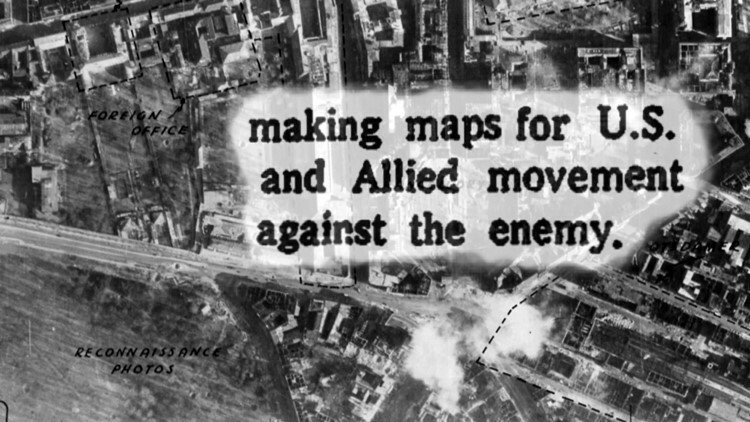 His team at TVA mapped more than 500,000 miles of enemy territory to provide crucial intelligence to the U.S. and Allied forces. "Think about half a million miles of foreign territory. That is tedious work you're doing and it required expertise," said Ezzell. Box of lost-and-found 16mm films shot by Granville Hunt in the 1930s and 1940s. "One of the things I remember about my father is everybody liked him. He never met a stranger and people liked him, which was a wonderful quality. He also cared so much about his work. He was someone who really liked cutting-edge technology and learning how things worked," said Hackney. "That is what I love in these films when you see my parents and grandparents designing that cabin and then doing the work. He instilled that in me. As soon as I was old enough to lift something, I was helping him carry photography equipment and take pictures." Hunt encouraged his daughter to learn how things worked. He was also supportive as she pursued an education in scientific fields traditionally dominated by men. her education in the fields of science that were dominated by men. "My parents were always very encouraging and helped me learn science and math. I was one of only three female students in the physics department at the University of Tennessee," said Hackney. Karen says she missed her first physics exam as a freshman at UT to attend her father's funeral. Cancer of the esophagus killed Hunt on Oct. 18, 1963, at the age of 54. Karen Robinson Hunt married fellow physics and astronomy student Richard Hackney in 1967. Both graduated from the University of Tennessee, pursued doctoral studies at the University of Florida, and were hired as professors at Western Kentucky University in the early 1970s. 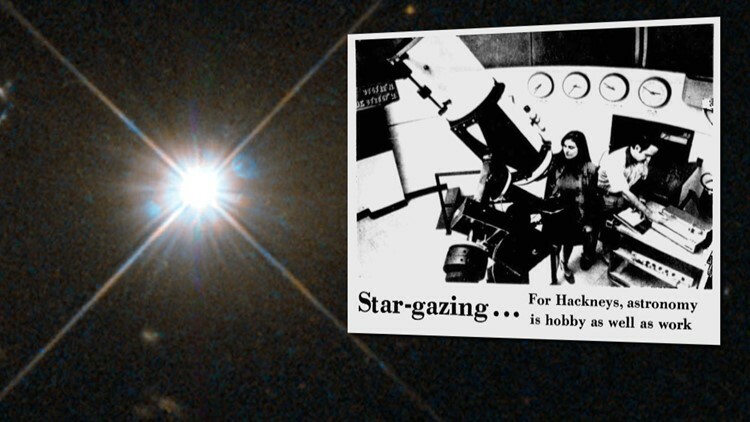 A Louisville Courier-Journal newspaper headline in 1978 reads, "Husband-wife team is studying quasar for clues to the origin of the universe." Capturing light on film was Granville Hunt's profession and passion. The little girl who helped her father take pictures grew up to capture light from the depths of the universe. As an astronomer, Karen Hunt Hackney recorded the light created billions of years ago as it finally reached our eyes in the present after a journey across the universe. "I like extremes. Certainly, the Universe is as extreme as you can get for a laboratory. I also like thinking about the future. That's why I loved working with students. They are our future," said Hackney. Hackney says her father's lost films are especially meaningful because she lost many photographs in a house fire in 2011. But the films serve as more than personal nostalgia. The gift from the past to the present is precious to Hackney for what it means to the future. "What I have enjoyed is how happy my son, Andy, is to see these films. He obviously never knew his granddad. He and his wife, Odette, live in Australia and I have two beautiful young grandchildren. My son has enjoyed seeing my dad playing with me the same way he does with his children. I'm also looking at this through the eyes of my granddaughter, Olivia, and grandson, Leo, and maybe their children someday. I like to think about the future. This is something people will enjoy seeing in the future," said Hackney. "I think he would laugh about that and say. He would say that he wasn't. I know journalists like to say they don't want to be the story. But you are reporting, photographing, and videoing history. When history comes, they are going to be part of it," said Hackney. "I would think people might enjoy seeing how Knoxville looked back then, regardless of who took the pictures." 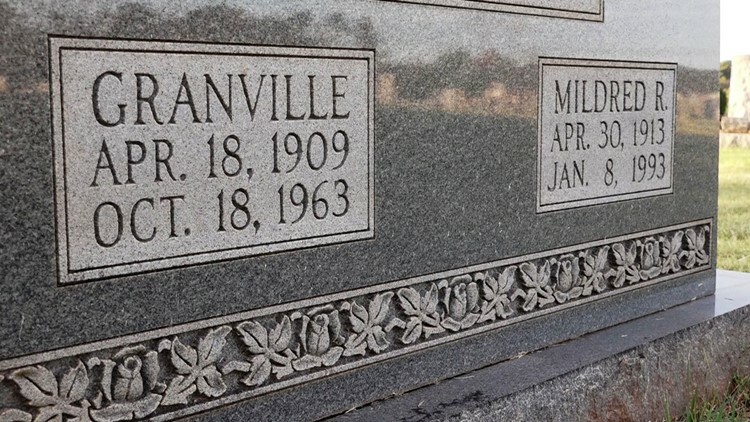 Granville Hunt is buried just a few miles from the historic Robinson Mill and family farm featured in some of his color home movies from the 1930s. The cemetery and the farm are only a few miles from a storage shed in Monty Barger's back yard in Sweetwater. 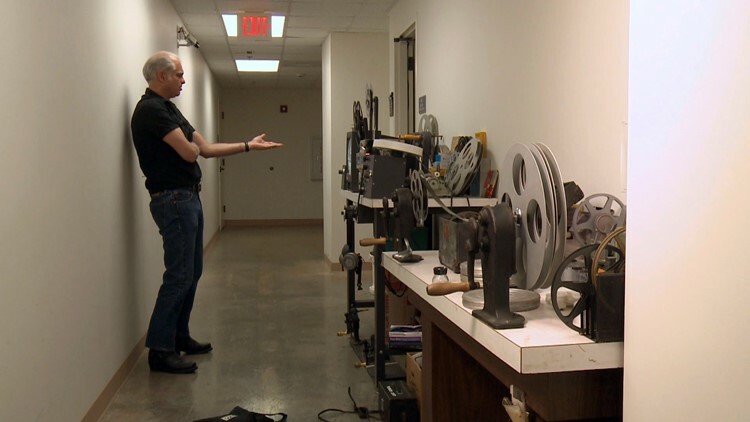 Barger stored the film for 46 years without watching it. He bought the box of film at a community auction in 1970, but could not get the projector to work. Now the box of film he nearly threw away is a historic treasure. "It is a miracle, one, that they were shot. Two, that they survived. And three, that they were able to make their way into the archive," said Bradley Reeves, a professional film archivist who founded the Tennessee Archive of Moving Image and Sound (TAMIS). "Think about how meaningful this footage will be to future researchers. People are going to be able to see what Knoxville and these other places were like in a way they never would have without these films." "It's a view we never would have had without Hunt's skill and his willingness to go into the Smokies and open up the area," said Charles Maynard. "I think when we make a discovery like this, it gives us all a greater sense of community," said TVA historian Pat Ezzell. "Whether you're new to Knoxville or you've lived here all your life, this is all of our history. This is something none of us have seen before. It belongs to all of us." A 1939 shot of the Rockefeller Memorial at Newfound Gap overlaying a 2018 photo from the same angle in the Great Smoky Mountains. Barger was given free digital copies of the film because he donated the originals to TAMIS. 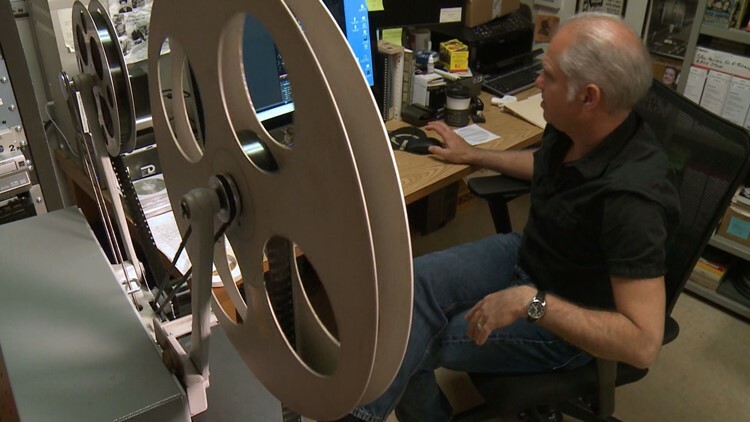 The film has been cleaned, placed in archival cans that allow it to breathe, and stored in a cold vault in the basement of the East Tennessee History Center. "We keep the film in a cold storage vault where we can control the temperature and humidity. Once they are stored in here, it slows down the deterioration process. They should be good for hundreds of years," said TAMIS archivist Eric Dawson. Below are links to full extended clips of Granville Hunt's lost-and-found footage, complete with shot logs that list the time of each shot with a description. The extras also include a then-and-now photo slider comparison tool with photographs taken in 2018 from the same angle as Hunt's footage in the 1930s and 1940s.